Hope have kept the key features of the Tech Evo master cylinder and worked to improve the ergonomics and integration on the handlebars. 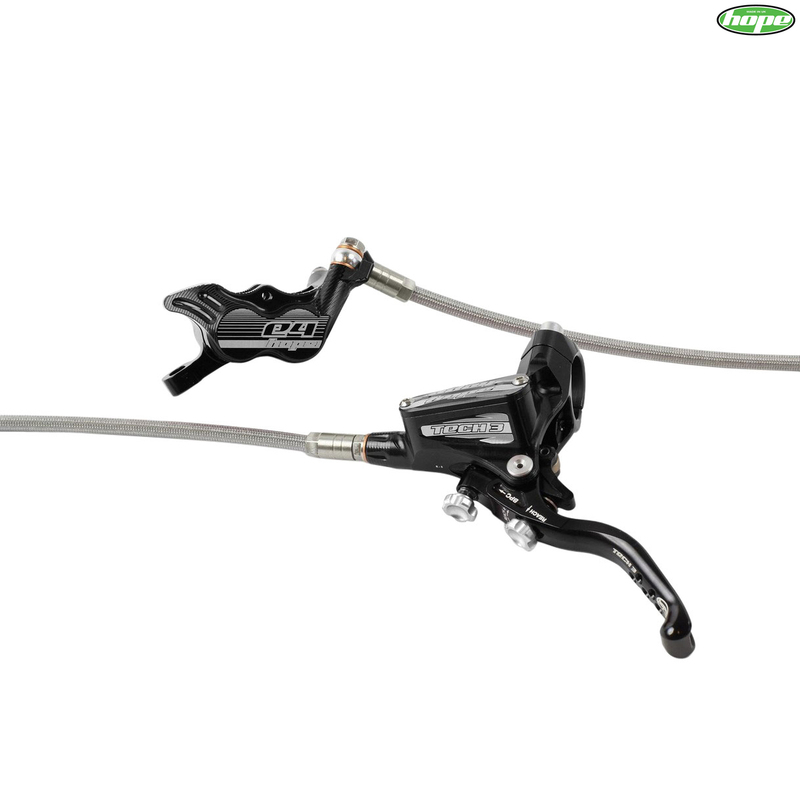 The Tech 3 master cylinder can operate all the calipers from Hope's range and offers a slight increase of power of about 5% over the Tech Evo. Popular design features of Tech Evo remain the same, such as the reach and bite point control (BPC) adjustability. The piston is actuated by a cam and a roller system to eliminate any free play and initial friction. The classic split clamp design makes the master cylinder easy to install on the handlebars without having to remove anything else. Hope have worked hard to make the new Tech 3 master cylinder easier to integrate on the bars although it does entail losing the ambidextrous design. The Tech 3 master cylinder is now directly compatible with any Shimano I-Spec type shifter meaning no extra mount is required to attach the shifter to the master cylinder. For those using SRAM shifters Hope have designed a slick and minimalistic direct mount adapter. The one piece caliper is CNC machined from a solid billet of 2014 T6 aircraft spec aluminium alloy. The E4 caliper uses four identical 16mm phenolic pistons which gives more useable power to the brake, whilst keeping their legendary "feel".